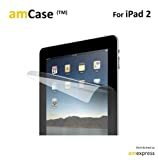 amCase (TM) Premium Screen Protector is made from superior quality 3-layer PET film, and specifically designed to fit apple ipad 2. It effectively protects the ipad screen from daily scratches, dust and scrapes. With self-adhering surface, the film is designed for easy application and zero-to-minimal bubbles during application. A bubble removal card is also included to remove the occasional bubble easily. Two screen protector films, micro-fiber cleaning cloth and bubble removal card are included. amCase (TM) is a trademark of Amz Express Inc. All amCase products are exclusively distributed by am express on Amazon com. There are no other factory authorized resellers. amCase trademark is protected by US Trademark Law.